Find the original instructions HERE. 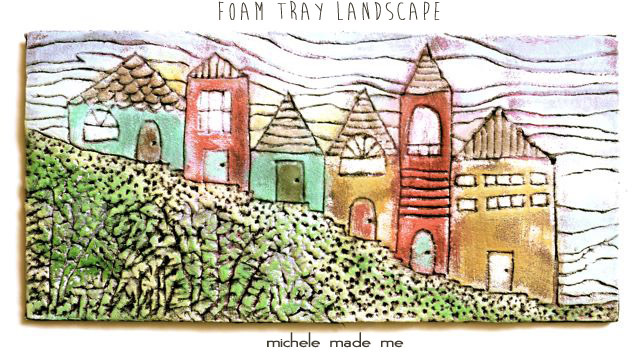 Your foam tray Art is exquisite! Aaaaaah! 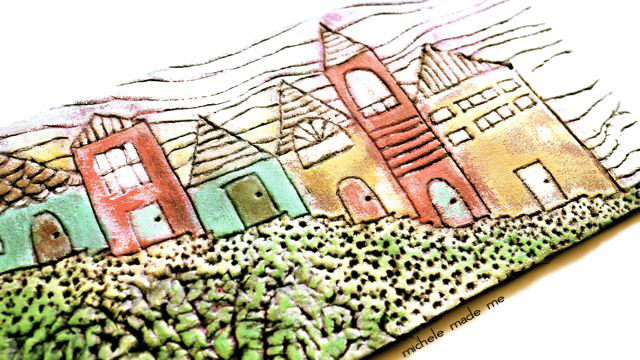 I love it, Michele! Yes, they look more like rustic stone or ceramic reliefs! But definitely awesome! You are pure creativity! I love it. This is amazing Michelle! I can just see a vertical row of three mounted onto a black background ... I will never throw away a foam meat tray ever again! This looks great Michelle! I absolutely love it! Its so much fun! I will try it with my child tomorrow! I will nevewr look at foam trays in quite the same way again! LOVE your landscape. How 'bout a Christmas village? incredibly clever idea and such a smashing result! This is really cool! Love the houses! I'm just catching up on all my emails so I can't wait to get to the post about how you did it!